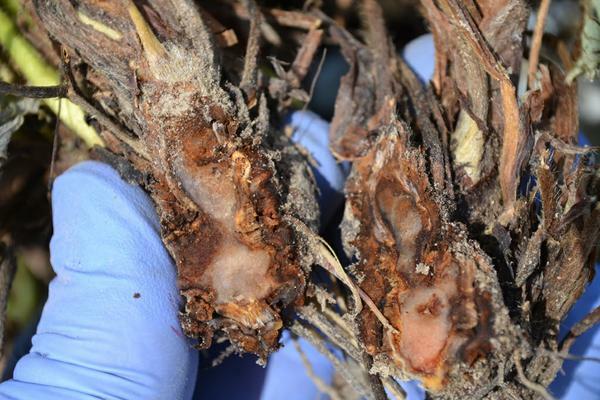 Southern blight is not a common problem, but has been reported to occur in North Carolina when environmental conditions are moist and warm. It can be a problem in southern low elevation nurseries. Diseased plants collapse, turn brown and die suddenly. The fungus usually kills only one or two plants in scattered spots rather than killing an entire field. S. rolfsii has a wide host range and is present in many soils. 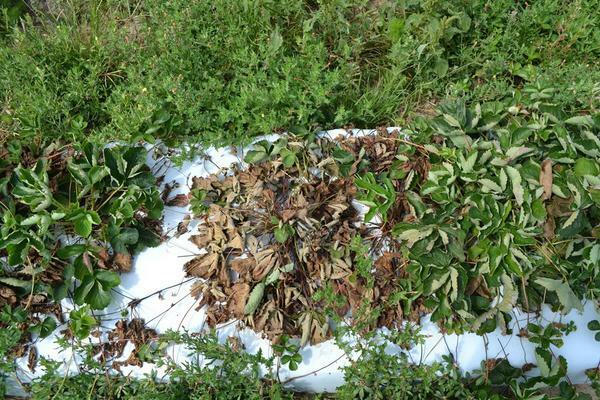 All parts of the strawberry plant can become infected. The first symptoms of infection appear on the lower parts of petioles and stipules of mature leaves. Later, the axillary buds are invaded and killed, and adventitious buds may not develop. The entire plant collapses and becomes crispy dry, often accompanied by white mycleial growth on the crown at the soil surface line (Figure SS-1, Figure SS-2) or on the lower crown and roots below the soil line. During wet periods, new transplants may be attacked and white mycelial masses observed on the roots and soil surface. Round sclerotia (white to brown, 1⁄8”) can develop around the crown of the plant and the bases of leaf petioles and are the primary means of dissemination (Figure SS-4). These sclerotia are also very diagnostic for the disease. This pathogen also causes soft rot of fruit. 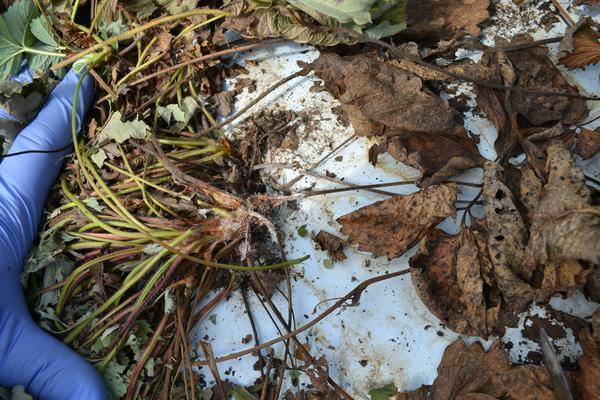 Figure SS-1: Whole plant and sudden collapse of plant due to southern stem blight. Figure SS-2: Collapsed strawberry plant showing diagnostic white mycelium at the base of the plant where the pathogen colonized the lower crown tissue. In many cases, small round and brown sclerotia are present. Figure SS-3: Cross section of crown in a plant that collapsed due to southern stem blight infection. Figure SS-4. 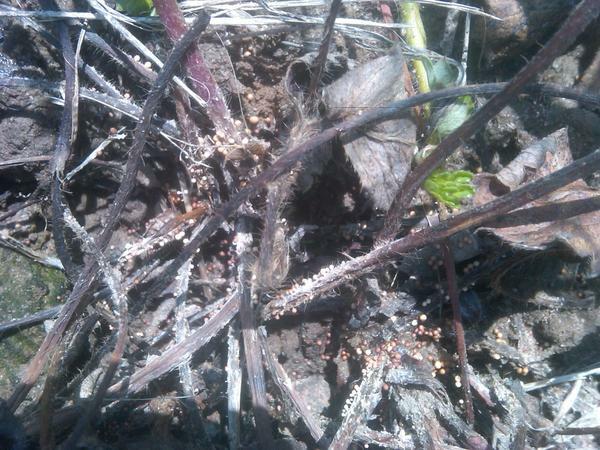 Close up of colonized strawberry tissue showing diagnostic sclerotia. Most nurseries conduct pre-plant fumigation and this is highly effective. However, the pathogen can escape or recolonize soils to cause low levels of damage. Mother plants and associated non-rooted daughter plants typically die before harvest. Avoiding fields with a history of Southern blight is critical. Major problems occur on other crops and extensive management recommendations are available if a specific farm operation has recurrent problems. Sclerotium rolfsii is a facultative, soilborne fungal plant pathogen that produces abundant white mycelium on infected plants and in culture. Advancing mycelium and colonies often grow in a distinctive fan-shaped pattern and the coarse hyphal strands may have a somewhat ropy appearance. Cells are hyaline with thin cell walls and sparse cross walls. Main branch hyphae may have clamp connections on each side of the septum (Aycock, 1966; Figure P-1). 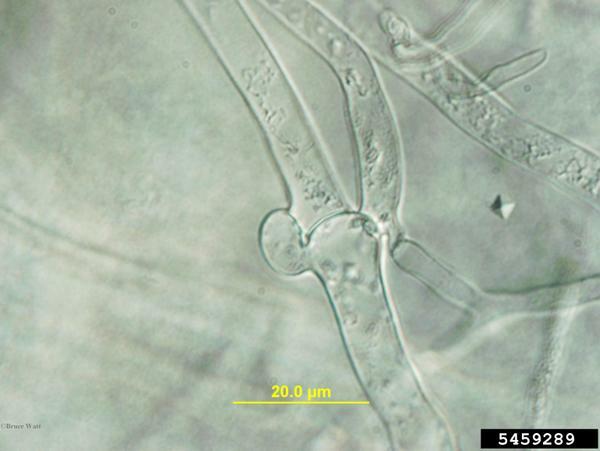 In agar plate culture, sclerotia are not formed until the mycelium covers the plate. In vitro or in vivo, sclerotia begin as small tufts of white mycelium that form spherical sclerotia 0.5-1.5 mm in diameter. Sclerotia darken as they mature, becoming tan to dark brown in color (Mullen, 2001). Young sclerotia often exude droplets of clear to pale yellowish fluids. Mature sclerotia are hard, slightly pitted, and have a distinct rind. Although most sclerotia are spherical, some are slightly flattened or coalesce with others to form an irregular sclerotium. S. rolfsii does not form asexual fruiting structures or spores. The teliomorph of S. rolfsii (Athelia rolfsii) is rarely observed on hosts or in culture. A. rolfsii produces basidia on an exposed hymenium and basidia produce four haploid basidiospores. The appressed hymenium develops in small, thin, irregular patches. The clavate basidia are 4-6 µm x 7-14 µm; basidiospores are hyline, 1.0-5 µm x 5-12 µm (Aycock, 1966). Figure P-1: Clamp connections of main branch hyphae of S. rolfsii. S. rolfsii is easily diagnosed in humid weather from the abundant signs of the pathogen. Under dry conditions, signs may not be apparent on the above-ground portion of the plant. When signs are absent, incubating symptomatic stems with the top of the root system for 24 to 48 hours in a moist chamber usually results in abundant vegetative growth of the fungus and later, production of sclerotia (Figure DP-1). Incubation is most successful if the symptomatic tissue is placed in direct contact with a moistened paper towel. The fungus can readily be isolated on a variety of agar media with isolation and culture on PDA being the most common. Cultures grow rapidly and should be transferred before the advancing colony margin reaches the edge of a plate. Cultures also can be obtained from surface-sterilized sclerotia. In spite of its vigorous growth, S. rolfsii frequently dies or becomes contaminated with parasites such as Trichoderma in culture. Isolates are best maintained as dried sclerotia or as mycelium on dried colonized grain. Figure DP-1: Abundant fan-shaped growth of S. rolfsii on an incubated strawberry plant. Aycock, R. A. 1966. 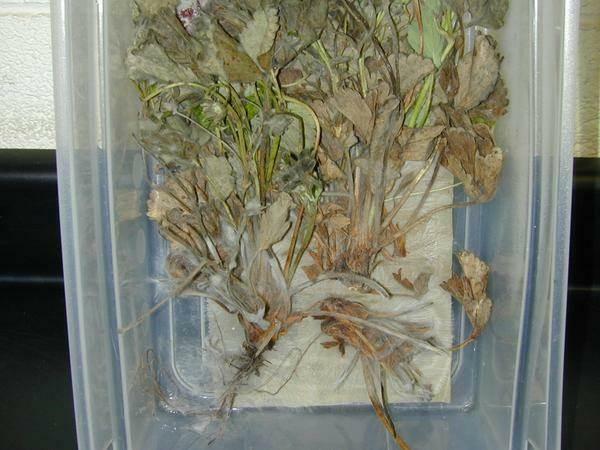 Stem rot and other diseases caused by Sclerotium rolfsii. NC Agric. Exp. Sta. Tech. Bull. 174. 202 pp. Mullen, J. 2001. Southern blight, Southern stem blight, White mold. The Plant Health Instructor. DOI: 10.1094/PHI-I-2001-0104-01.